Google Project Ara: What's The Hold Up? Home / Technology News / Google Project Ara: What's The Hold Up? Google might have gone a bit sideways with the Nexus 6, but before that the company has proved it clearly knows a thing or two about what your typical Android phone buyer wants from their devices; something that's not too expensive, not too fussy, and nicely tailored for a great experience on the Android paltform. No frills, and no uneccessary bits that bump up the cost, essentially. So it's not too surprising that the firm has looked into its crystal ball and realised that there's a market for a user-tailored phone experience. The modular smartphone. Similar to the custom PC market, there will be users out there who want to simply buy the bits they need to do what they want to do, and to be able to upgrade/retrofit whenever they like. Google's solution is Project Ara. The concept is a simple one –– you buy a basic model Ara phone and all the bits can be pulled off and swapped as you see fit. Fancy a more powerful camera module? You'll be able to buy one through Google's dedicated store - a treasure trove of hardware modules populated by components made by third-party manufacturers, from the likes of Samsung and its ilk, right down to little independent devs working out of their basements - just like Google Play for apps, in fact. The same will be true of many other components, including things like memory, display panels, physical keyboards, sensors and scanners, ports, modems and wireless modules, and much, much more. The Verge got a look at some Ara prototypes at Google HQ. Here's an extract from their report: "This very early version of the phone we played was functional, although we weren't allowed to turn it on and use it, in part because the touch features aren't up and running, Google said. The company showed it booting up on stage, but not working. The hardware itself feels very solid, thanks to its aluminum and steel frame, which looks like a ribcage when all the modules are popped out. The modules on the other hand feel light and plasticky, and made holding the phone feel a bit strange. If you're used to the smooth corners you'd find on most smartphones, the ribbed channels on the Spiral 2 feel bizarre. Nothing rattled or slid out while we were playing around with it, though it's hard to tell how it will really work without the magnets." More recently, Google provided an update about what it has been up to since announcing some prior details about Ara at I/O 2014. The Big G has been busy working with Marvell and NVIDIA in order to get some reference CPUs made for Ara. Below is an extract from Google’s G+ update on the subject and what progress has been made. “For the AP modules, we have been working with our friends at Marvell and NVIDIA to create two separate reference designs and form factor module prototypes around their PXA1928 and Tegra K1 processors, respectively, using a Toshiba UniPro bridge ASIC to connect to the on-device network. You can anticipate seeing these as part of the reference designs in our upcoming MDK v0.20 release. (The Rockchip AP with native UniPro that we blogged about previously is coming along nicely and will be ready in time for our Spiral 3 prototype in the Spring. ),” said Google in a post on Google+. Well it's official folks, Project Ara is go according to a post by Google's ATAP division which posted a video to Youtube and its Google+ page. The video's emphasis is in showing off the potential of Ara's modular nature, what components are "part of it", and that "you" (as in, anyone who wants to be a module dev) are also part of it. The vid also hints that things will kick off in Peurto Rico as the location is named as "the first part of it" and that the Market Pilot will begin in 2015. According to Google, the region itself has a pretty undeveloped landline system –– 77% of the population use mobile phones as their primary communication tool. This means the mobile space is pretty competitive too, with AT&T taking the lion’s share of the market with 25%. But there are local players. And Google is teaming up with two of these, OpenMobile and Claro, to launch its Ara phones. It is currently unclear what modules will initially be available at release, but Google did talk about using removable 1280 by 720p screens, as well as cameras, batteries and wireless units. For a little while now there's been a big question mark hovering over when Ara will be introduced to the rest of the world, but now it seems we have an answer. In a report published on March 2,Pocket-lint detailed having spoken to reps of device manufacturer Yezz, which claims to be heavily involved in Ara and suggested the modular phone will arrive worldwide during August 2015. Yezz was speaking from its stall in attendance at MWC 2015 where it was showcasing a selection of Ara modules, including a gaming controller. The company revealed that it will be working with Google on Ara modules due to its "agility in development and manufacturing". "Yezz will be contributing to [Ara's] vast accessibility, collaborating to establish a viable module marketplace that will allow for optimum customisation," Yezz told Pocket-lint. Check out some of the images PL snapped below, noteworthy modules, as well as the game controller, appear to include a fingerprint scanner, a media control button module (for music/film playback), an NFC chip, and what looks like some kind of removable storage. So What's The Situation With The Ara 2015 Launch? Ok, so the best laid plans of mice and men, and all that. It seems things have not gone as smoothly with the push for Ara to get a proper launch inside 2015 as Google had originally hoped.Project Ara's Twitter account has posted several Tweets explaining that the project has been delayed, likely until 2016. A post by blogger and analyst Dr Richard Windsor, suggests Google has tripped up on the fact that "a modular device is far harder than it sounds." In his report, Windsor states that Google was planning to launch in Puerto Rico (as outlined above) during 2015, but the project is now in "on hold". "This may have something to do with the new move to be more cost conscious as I continue to believe that Project Ara will be another financial black hole like Google +," he writes. Windsor notes that Google isn't the only firm in the smartphone space trying to develop a modular device and adds that all of them are "having difficulties." "Making a modular device is extremely difficult because modularity adds a new series of requirements and constraints. A modular device is a phone, tablet or other device where individual components such as the screen, camera, CPU, battery, memory can be removed by the user and replaced by others with a different specification. Each module requires an individual case and a connector. These take up space, making the resulting device bulkier and less sleek-looking than a normal device. Each swappable component has to remain distinct from all the others. Integrating components together is a tried and tested method of cost and size reduction meaning that a modular device has always been more expensive to make. Every swappable component has to be tested with every other in every possible configuration to ensure that they all work together properly. This means that testing and certification is much more onerous meaningfully increasing development costs." "It must be the same size and weight as competing products. It must offer the same functionality as competing products. It must come at the same price point." "I suspect that it will be one of the larger players that is well financed, has a track record in hardware design and has money for marketing that eventually cracks it." In our thinking though, surely Google would qualify? It has so much money and a successful devices project with the Nexus line. Project Ara Back With Motorola? Well this is an interesting turn. According to information from Facebook tech page Hellomotohk, the Ara project may have been placed back in Motorola's hands. "According to our sources, Project Ara has returned back to Moto, R & D base in Beijing," the page states. Allegedly when Google sold Motorola to Lenovo it didn't part with every piece of it, some bits stayed behind, in particular the "Advanced Technology Group" and a whole bunch of patents - these sections are apparently where Ara is being handled now. Ahead of Ara’s release, Linaro, a non-profit engineering firm involved in the ARM open-source community, spent a little hands-on time with Google’s prototype Ara device. In order to better understand the technology and the problems facing its adoption, Linaro posted a video outlining its findings, as noted by Android Authority. Arguably one of the biggest things about Project Ara is how it could go some way to levelling the playing field when it comes to hardware development. Just as with apps on Google Play, which sees small, independent developers making apps that prove just as popular with punters (and as profitable) as those coming from big names like Samsung, HTC, and indeed Google itself, Google's Ara marketplace will allow garage-based developers to sell hardware components alongside industry giants. So far though, much of the talk about Ara has focused on these small independent devs whipping up nifty components with 3D printers in their basements, we haven't actually seen a lot of what big name companies might do with the concept. Until now, that is. World famous German audio specialist Sennheiser has stepped in to show what it has planned for Ara. Collaborating with Phonebloks (a company which was working on modular phones before Ara came into existence and which has since become very close to Google via the Ara project), Sennheiser has come up with some module concepts for improving the audio aboard your Ara device. The first of these is dubbed "Amphion" and promises "Audiophile audio. On a phone." It will allegedly offer some incredibly high quality capture and playback using a "class G" amplifier and low-noise microphone. It also has a low latency digital signal processor, which feasibly could be used to link up to custom Sennheiser audio equaliser setups, and offer built-in digital effects at the same time. What's more it can be programmed by the user (if you're that way inclined), meaning you really can tweak it for a range of use scenarios. Sennheiser claims it's so good that even the likes of professional musicians, and journalists like us lot, will be lining up to use this little mod. Next up is "Proteus", featuring dual audio jacks - there's a wide range of applications here for audio sharing and output, but also multiple microphones for directional audio capture. That's it for now, but it definitely highlights the other strength of Ara: user choice. Sennheiser's gearing up to offer something for people who really want the best audio experience on their smartphone. According to reports Project Ara will be making an appearance at Mobile World Congress at the beginning of March, alongside a selection of modules being prepped by third-parties. And now Toshiba has unveiled its own contribution to the tantalising modular phone project, naturally the subject here is camera modules. The company revealed a 2MP front-facing module for selfies, and both 5MP and 13MP rear-facing primary modules. Toshiba says it has three-year development plans in place and the first set of hardware will be available during 2016. The Japanese camera firm also released a video showcase and has a dedicated site for the modules. Perhaps unsurprisingly, Google's taken the opportunity to showcase Project Ara a little bit at its Google I/O conference. A video has been uplaoded to Youtube showing project chief Paul Eremenko assembling an Ara handset from component modules and booting it up. Well, sort of booting it up. Such teething issues are perhaps to be expected at this stage, but the device only got as far as Android logo - no lock screen or anything else. Still, Eremenko did say that it's an early stage of development and nowhere near ready for public release, making it rather brave to show it trying to operate in public for the first time. Eremenko described Ara's goal to allow users to choose a smartphone first then add key components, rather than picking a smartphone based on what pre-specified components a manufacturer has already added that are fixed. Cameras are the easiest and most relatable example, because some users don't care about cameras at all while for others its a key selling point, and a lot of phones make a big song and dance about their camera tech. We’ve seen Project Ara before when it was revealed as a Motorola project, but plenty of more interesting details are emerging now that Motorola’s been sold to Lenovo and, apparently, the reins of the project have been handed over to Google itself. 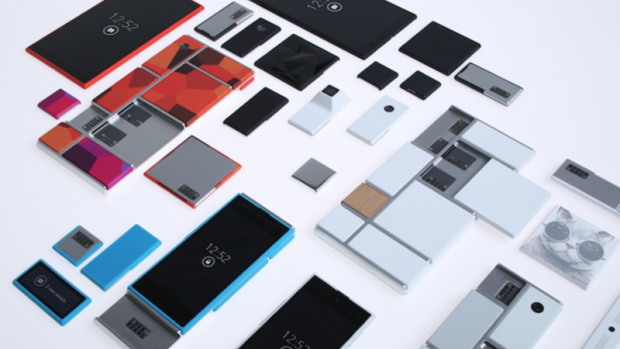 In case you missed it, Project Ara is a concept phone with a modular design. The theory is that you’ll be able to swap out different components to build the phone you want. Don’t care about cameras? You don’t have to bother buying a camera module then. Or maybe you are really into your photography? Okay, so instead of opting for basic 5-megapixel module you could grab a hefty 13-megapixel sensor with optical stabilisation – or maybe something better than that. Physical keyboards, enhanced speakers, different sized battery packs and different connectivity modules with varying modems and ports are also all on the cards. When the concept was first wheeled out in October 2013 most people thought it was a long-term pipedream, a really great idea, but it couldn’t be anywhere near production. As it turns out we could see the Ara arrive much, much sooner than expected. Motorola’s former CEO Dennis Woodside explained in a December interview that the project was actually “pretty close”, he pointed out that the only thing which needs finalising is the “interfaces and protocols” which allow the modular component pieces to “speak directly to the CPU”. But more recently Google has actively set some wheels in motion. The company took to Google+with some photos revealing a prototype skeleton filled with circuits and connectors – this isn’t a concept render anymore, this is a real piece of kit. Time reports that Ara could arrive as a buyable product as early as the beginning of 2015 and for a price as low as $50. Meanwhile, Google has dropped hints that it plans the Ara to be available for as many as 6 billion people. That basic package would reportedly only come with Wi-Fi but users would have the option of adding 3G and 4G radios if they wished to. Again, you spend as much or as little as you want to get the phone you want. Plans from Google’s Advanced Technology and Patents department (ATAP), which is leading the project, allegedly aim to finish that prototype as a fully functional unit “within weeks”. The Android giant has also announced it will hold an Ara developer conference in 2014 over April 15 and April 16 in California. We should clarify that in this context the term developers likely not only means people working with software, but also hardware, because as Woodside emphasised in his interview, Ara is intended to introduce “open source” hardware for developers to get cracking on, just like Google’s Android software has a rich ecosystem floated by thousands of developers. Google has even mentioned there’s an idea for a Google Play Store equivalent for developer-made Ara hardware modules. You’ll be able to order them, have them delivered and slot them into your phone. The modules are reportedly as little as 4mm thick in some cases and overall bulk for the most decked-out Ara handsets isn’t expected to surpass 10mm in total thickness of the devcie. The modules will use a secure locking system so that should you drop your handset it won’t explode into its component bits. “Removing a module will require disengaging it through an app on the phone, which will release whatever mechanism was locking it in place,” reports The Verge. Presumably any software required for things like advanced cameras will have a partner app issued through Google Play. According to Time’s report, Ara will come in three size variants at first; “mini, medium and jumbo”, which will cover all currently popular sizes from compact to phablet. While nothing specific has been said, in theory each size variant could offer a smaller or greater number of module slots. For fans of aesthetics it’s not just functional modules that are planned either. Google reportedly has its eye on leveraging 3D-printing to enable user customisation of material types, design style and, of course, colour – some concepts have even shown patterened panels. Needless to say, the Ara is shaping up to be a real game-changer. And only just in time too, as recent major flagship launches have highlighted over 2013-2014; the hardware race is slowing down, something big needs to change. Google would also be able to simplify its mobile strategy. All the talk of manufacturers producing budget phones for emerging markets and premium devices for already buoyant markets is rendered moot by a handset which can straddle both.